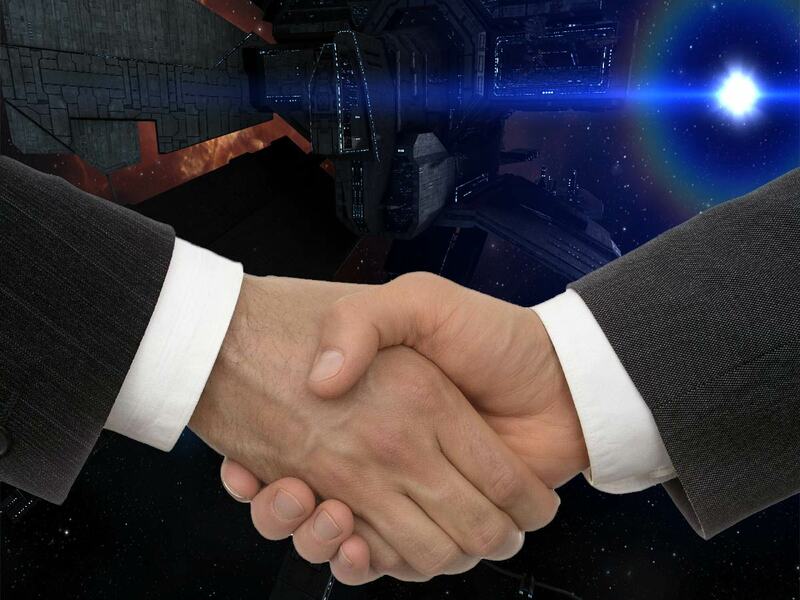 Third Party Service, Collateral Holding and Insurance issuing are a group of EvE® Online meta professions. For a brief background about EvE meta professions please look here. While having a somewhat lower entry barrier than auditing, these meta professions still require complete trust by all the involved parties. Sometimes the assets values involved in the transactions may reach 100 billion ISK. In a game like EvE, where unchecked and consequence-less scamming and stealing are considered foundation gameplay features, this means one sure thing: only few individuals will be more or less universally trusted enough to find wanting Clients. Even less will stand out and stick around for years. What is a Third Party Service? A Third Party Service (sometimes spelled: “3rd Party Service”) is an intermediation middle-man between two parties with no trust relationship. The Third Party Service representative has to be fully trusted by both the other two parties for this kind of business to work. The Third Party guarantees that the transaction between the two other parties will be smooth and secure. There are usually pre arranged plans to engage in case something goes wrong. The Third Party Service cannot afford any smear on his / her reputation, else their EvE career in this niche specialty is over. This is expecially bad, because it literally takes years to earn the amount of trust needed to be accepted in this profession. There are several variations of this service and several kind of assets that may be involved. Bond and IPO collateral (see Collateral Holding). Checks and information (Auditing would be a super-set of this). Personal / corporation / alliance ransoms. Lotto prizes or collateral holding. Wormhole appraisal and bookmarks sales / trading. Financial assets securing, this includes both in game items and shares and virtual shares. Because of how BSAC’s virtual shares are implemented, they are not supported by this service. Other virtual shares including funds and IPOs’ are supported. Checks and information in all their forms including audits (see the auditing section on this web site for more information), including alliance level audits. Role Play compliant audits are also available. Collateral Holding in all its forms, including self collateralized loans. Lotto prizes or collateral holding. Only 3B or higher prizes lottos will be accepted. Wormhole bookmarks sales / trading. The following is a typical suggested sequence of tasks to perform in order to complete a transaction by using a Third Party Service. Please notice how the sequence may take vast modifications depending on the exact transaction kind and on the possibility for some of those transactions to happen between two actors and not three. In case you are interested in a character / corporation check or an 1">audit please refer to the specific article about them. For publicly tracked transactions / lottos, create a transaction prospectus draft but do not post it right now. Many hastily cobble a terrible prospectus together, post it on the forum and act surprised when it invariably gets flamed by other players. Don’t do that, it’s possible you won’t even get the Third Party Service to accept working for you. Contact a Third Party Service representative. Have ready the details including possible requests about what to do in case something goes wrong. Certain jobs will require to share your characters or corporations API keys with the Service itself. API keys are created at this EvE Online web site page. Examples of such jobs are: checks, audits and lottos collateral holding. The Third Party Service representative will state the fee for his work. Depending on the kind of work, the fee will be paid by one or both the parties. Listen to the possible representative suggestions and criticism and update the prospectus (public transactions) accordingly and send the new draft revision to the representative for further review. After prospectus is OK, proceed posting it (public transactions). The Third Party Service representative will usually add his own confirmation. The first party contracts / sends the item(s) / securities plus fee to the Third Party Service. The Third Party Service will post (public transactions) or contact the second Party and clear them to send the agreed money / other items to the first party. The first party confirms (and, for public transactions, posts on the forum about) the succesful receipt to the Third Party Service representative, who in turn will deliver the held item(s) / securities to the second party and (for public transactions) post about the succesful operation on the forum. The ship buyer sends the super capital ship purchase price plus third party fee to the Third Party Service representative. This money transaction may also happen after step 4, depending on how much trust he got in the Third Party Service. The Third Party Service sets up a Player Owned Station (POS) in a quiet and secret low security system. The Third Party Service representative tells the ship seller where is the POS location and the password to enter its shields. The seller jumps to the system, warps inside the POS shields and ejects from the super capital ship. An alternate procedure is to shutdown the POS shields and just let the seller directly warp to the POS (safer). The Third Party Service representative changes the POS password to lock out the seller and checks that the supercapital is in the condition (fittings, fuel etc.) buyer and seller have agreed upon. The Third Party Service representative tells the buyer where is the POS location and the new password to enter its shields, gets access to the POS shield, boards the ship and verifies everything is as agreed upon. The buyer jumps out and the seller receives the money held by the Third Party Service representative. Once the deal is concluded, the Third Party Service takes the POS down. Do not trust the first guy pretending he is a trusted Third Party Service! EvE does not punish scammers and thieves. You are meant to do your due diligence and find out who you may trust. Third Party Services often are one man operations, usually heavily advertising their flawless track record and testimonials. Fake testimonials may be produced by fraudsters but they are usually easily spotted. Third Party Service customers are typically elder, wealthy members of large alliances while fake testimonials will easily show up as NPC corporation, younger players, sometimes their posts will be clustered in a short time frame (i.e. 5 players posting within 1 hour). Do not trust the first guy pretending to be a celebrity Third Party Service! While EvE End User License Agreement forbids character impersonation, there have been many attempts at creating characters with the same name of famous Third Party Service representatives except for a letter, replacing an “O” with a zero and so on. Here is a list of the most known Third Party Services. It’s in alphabetical order so not to hurt anyone’s sensibility. Notice how some of them may be currently inactive. There are recurring threads about those Services listing their names as well. Oh my goodness! Awesome article dude! Thank you so much, However I am encountering problems with yyour RSS. I don’t understand the reason why I can’t join it. Is there anybody else having similar RSS issues?Anybody who knows the answer can yyou kindly respond? Thanx!! I have just checked, the RSS streams deliver content, you should be able to access them.They are: RSS Feed and Comments RSS feed. Hi to every one, it’s actually a fastidious for me to pay a quick visit this web page, it includes helpful Information.